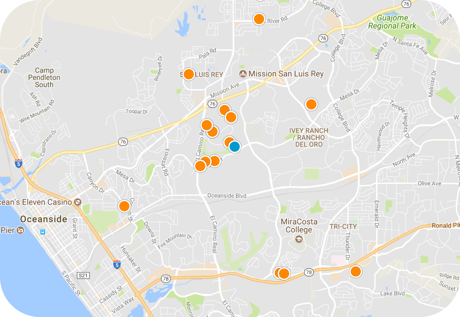 San Diego Home Sales website search offers all Oceanside homes, condos and foreclosures for sale. You are able to get new property listings daily that meet your search criteria. The third-largest city in San Diego County, Oceanside, California, is home to a population of around 180,000 in the San Diego area of Southern California. It sits on more than 40 square miles in the northwestern portion of the county, with some areas of the city, as the name suggests, bordering the shores of the Pacific Ocean. It has a six-mile stretch of beaches. San Diego Association of Government estimates taken in 2005 put the city's median household income at almost $62,000. The city is located about 40 miles due north of downtown San Diego along the coast. Oceanside has a large and diverse economy. It is home to the headquarters of companies like Genica Corp., Bergensons Property Services, Learning Forum International and the International Stem Cell Corp. Its 10 largest employers, all of which have at least 300 workers, are: Tri-City Medical Center, the city of Oceanside, Mira Costa College, Select Staffing, the North County Transit District, Genentech, Milagro Ranch, Ocean's Eleven Casino, Hydranautics and the Registry Network. It is also just south of the Marine base, Camp Pendleton, one of the military's busiest. The city's Oceanside Pier is the longest wooden pier located on the West Coast, at almost 2,000 feet long. The community's beaches are popular with surfers and as such downtown is home to the California Surf Museum. Annual events include a large Day of the Dead (Dia de los Muertes) festial in November, an Oceanside Harbor Days festival in September and the Southern California Beach Soccer Championships, the second-largest beach soccer festival in the world. The city is home to a whole host of local parks, golf courses and shopping centers. The Tri-City Medical Center provides routine and emergency medical services for those throughout the area. Public schools in the city are overseen by one of five school districts, with many elementary schools, four middle schools and four high schools, including one charter school. The city is home to two community colleges, Mira Costa and Palomar colleges. Additionally, there are several four-year colleges nearby, including San Diego State University, California State University-San Marcos, and the University of California's San Diego campus.